Necklace mix, glass, mixed colors, 4mm - 11x5mm multi-shaped, transparent to opaque, 27-inch continuous strand. Sold per pkg of 12. Item Number: H20-2548JE Have a question about this item? 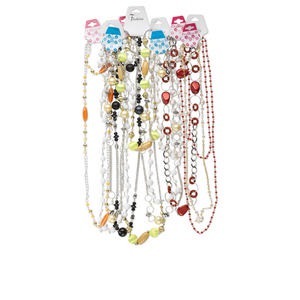 Accessorize with color! 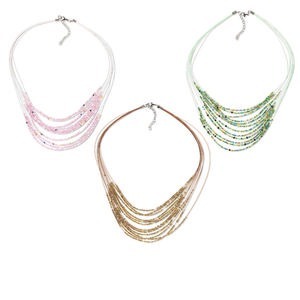 Continuous, 27-inch necklaces are full of shapes, sizes and lively colors - from transparent to opaque. 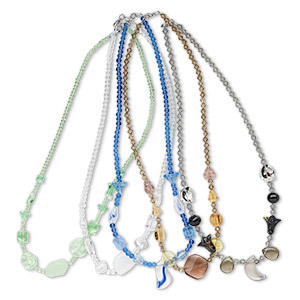 Economical necklaces are great gifts as just-for-fun jewelry. 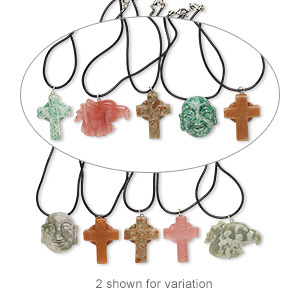 Wear as-is or use the variety of solid color glass beads in your own creations. Solid color means the base color of the glass is saturated throughout the object and will not fade or rub off over time. 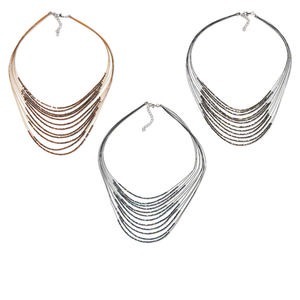 Shapes vary and may include oval, tube, round, rondelle, freeform and more. 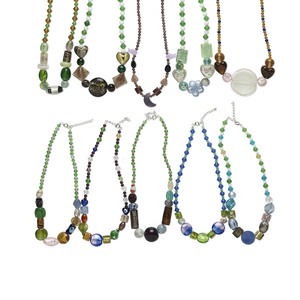 Some necklaces may also include cat's eye beads. 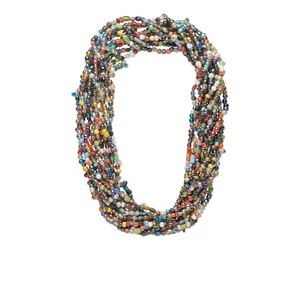 Necklace mix, glass, mixed colors with luster finish, 6mm-11x8mm mixed shape, 27-inch continuous loop. Sold per pkg of 12. 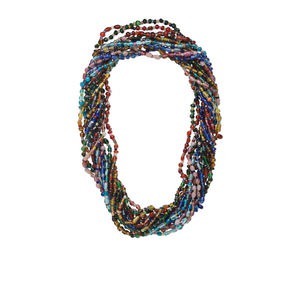 Necklace mix, glass, mixed colors, 2.5mm-15x11mm mixed shape, 27-inch continuous strand. Sold per pkg of 12. 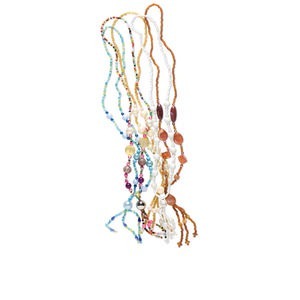 Necklace mix, glass, transparent to translucent mixed colors, 3mm-9x7mm multi-shape, 27-inch continuous strand. Sold per pkg of 12. Necklace mix, glass / nylon / silver-finished steel, mixed colors, 16 inches with 2-1/2 inch extender chain and lobster claw clasp. Sold per pkg of 3. 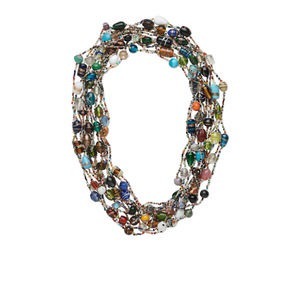 Necklace mix, multi-strand, glass and silver-finished steel. pastel mix, 16 inches with 2-1/2 inch extender chain. Sold per pkg of 3. Necklace mix, acrylic, brass and assorted materials (natural / dyed / manmade), mixed colors and shapes, 52 inches. Sold per pkg of 10. 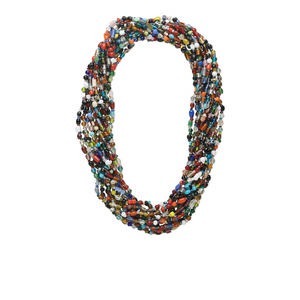 Necklace mix, glass and acrylic, multicolored, multi-shapes in multi-sizes,15" to 16" continuous loop with tassel. Sold per pkg of 5. Necklace mix, multi-gemstone (natural) / glass / rubber / steel / "pewter" (zinc-based alloy), 36x32mm Buddha / 40x30mm cross / 49x34mm eagle, 18 inches with lobster claw clasp. Sold per pkg of 5. Necklace mix, pressed / lampworked / dichroic glass / imitation rhodium-finished brass, mixed colors, 23x16mm-40x40mm mixed shape, 16 inches with 1-1/4 inch extender chain. Sold per pkg of 5.